UPDATE: Guardian article (see below). Following on from my previous post, the BBC had this today. It reduces even further the very little confidence I have in WADA and the way in which the “sporting establishment” have permitted “stars” to cheat. Of course these doped up athletes could do nothing wrong because they were officially permitted to “do wrong”. Sir Hugh Robertson, vice-chairman of the British Olympic Association, told BBC Radio 5 live’s Sportsweek: “Whatever you think about whether he should have been allowed to do this, the fact is the anti-doping rules at the time allowed him to do so”. If Bradley Wiggins had not been a star, and from a “sporting power”, I wonder if he would have got dispensation to cheat. The article in today’s Guardian is more of the same but it seems pretty clear that Bradley Wiggins was given official sanction to “cheat” by the UK cycling authorities. Guardian: …… which invited more questions than it answered in dealing with the trio of therapeutic use exemptions granted to Wiggins in 2011, 2012 and 2013 to allow him to take the powerful corticosteroid triamcinolone, for legitimate medical reasons before his biggest races of the season. ……. …….. “This was to cure a medical condition. This wasn’t about trying to find a way to gain an unfair advantage; this was about putting myself back on a level playing field in order to compete at the highest level,” Wiggins said, explaining why he had received an injection for 40mg of triamcinolone just before his triumphant 2012 Tour. He said he had “really struggled” with respiratory problems in the run-up to the 2012 Tour one of the high points even among so many in that golden summer for British sport. But he did not really explain how that tallied with the account he gave in 2012 in his autobiography. Nor did he really manage to explain the contradiction between the “no needles” rhetoric espoused in the same book and the fact he received injections of a powerful drug just before the biggest races of his life; nor the fact that he has never discussed the TUEs in any of his books or since. His contention that he believed questions on needles to refer exclusively to doping is similarly hard to countenance. It is time for WADA to be open about all athletes who have TUE’s. It’s difficult not to be cynical. When top athletes get out of breath while competing it is called “Exercise Induced Asthma”. Getting out of breath is surely a consequence of the athlete’s physical condition and it seems to me that EIA is an entirely invented medical condition. This allows them to get a “therapeutic use exemption” (TUE) and then use asthma medicine to improve their breathing. 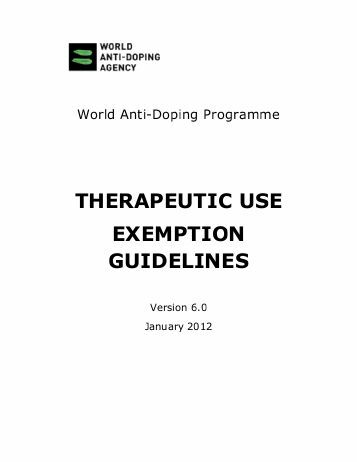 The TUE is effectively being used as a doping licence. Why inventing a “medical condition” and then using drugs is not considered cheating is beyond me. Daily Mail: Six more Team GB athletes have had their medical data leaked by a group of Russian hackers calling themselves the Fancy Bears. In the latest batch of data stolen from the World Anti-Doping Agency, the Fancy Bears list the therapeutic use exemptions (TUEs) granted to 41 athletes. The British athletes were revealed as sprinter Harry Aikines-Aryeetey, sailors Sophie Ainsworth and Saskia Clark, rower Richard Chambers, cyclist Steve Cummings and gymnast Nile Wilson. As with the vast majority of the previous batches, all six of these athletes have been allowed to take medication for their asthma via inhalers. The drugs in question have since been removed from WADA’s banned list and therefore no longer need any special permission for their use. Among the international athletes in this batch – the largest so far – are Swiss cycling star Fabian Cancellara, American golfer Patrick Reed and US distance runner Galen Rupp. Team GB now accounts for 23 of the 107 athletes named by the Fancy Bears, with top names such as Chris Froome and Sir Bradley Wiggins among those targeted. Under pressure from out of breath athletes and their trainers, these asthma inhalers are no longer banned. WADA may as well remove all restrictions on all drugs. I find WADA hypocritical. The acronym could just be for the “World Approved Drugs Association”.